Seagrass distribution was recorded by snorkel dives on a grid of stations in the waterfront of Club Méditerranée at Mon Choisy–Trou Aux Biches lagoon (NW Mauritius) and subsequently mapped using SURFER 6 computer software. Above-ground (AG) and below-ground (BG) standing biomass in terms of dry weight (DW) and ash-free dry weight (AFDW) as well as shoot density and shoot length were monitored monthly from June1997 to May1998 in a mixed stand of Halodule uninervis and Syringodium isoetifolium (dominant) at a shallow, nearshore station in the lagoon. Measurements of physical and chemical parameters [water temperature, current speed, salinity, pH, dissolved oxygen (DO), nitrate and phosphate concentrations] were made simultaneously, as well as at a reference station (ORE) outside the coral reef. The bottom sediment was analysed for grain size and type composition. Variation patterns were examined and statistical correlations drawn to relate plant performance to the environmental variables measured. The SURFER 6 programme generated a satisfactory contour map of seagrass distribution in the lagoon with a cover range of 0–60%. The densest patches occurred adjacent to the shoreline experiencing weaker water currents (3–13 cm s–1) rather than near the reef (5–35 cm s–1), where seagrasses were absent. Sand (0.063–2 mm grain size) constituted 97.2% and 77.6% of the nearshore and near-reef sediment, respectively. The dominant grain types were derived from corals (about 80%) and mollusc shells (about 14%). The recorded range of total standing biomass for H. uninervis was 243.1–468.2 g DW m–2 (326.9±71.7 g) or 71.7–141.2 g AFDW m–2 (96.8±20.1 g) and for S. isoetifolium it was 271.7–758 g DW m–2 (460.4±167.1 g) or 119–220.5 g AFDW m–2 (155.1±26.5 g), with a maximum biomass increase during September–December in both species. AG:BG biomass ratios were generally <1 and approximated 1 during the warmest months of December–February only. Mean shoot density (1,077–4,364 shoots m–2 in the overall range of 998–4,428 shoots m–2) and mean shoot length (10.9–20.8 cm in the overall range of 7–31 cm) in S. isoetifolium were higher than in H. uninervis (1,732–4,137 shoots m–2 in the overall range of 1,522–4,327 shoots m–2 and 7.9–13.7 cm in the overall range of 6–20 cm, respectively). Temperature showed strong positive correlations with total AFDW biomass of both species (r=0.755, P<0.01 for H. uninervis; r=0.679, P<0.02 for S. isoetifolium) and with DO (r=0.925, P<0.01). High DO levels (10.7–11.2 mg l–1) coincided with optimum standing biomass at 27.2°C. Correlations were also strong with shoot density (r=0.881, P<0.01 for H. uninervis; r=0.952, P<0.01 for S. isoetifolium) and shoot length (r=0.752, P<0.01 for H. uninervis; r=0.797, P<0.01 for S. isoetifolium). Under optimal environmental conditions, nutrient inputs from surface run-off or underground freshwater seepage in the lagoon due to heavy rainfall may boost up seagrass biomass, as suggested by positive significant correlations between phosphate levels and AG AFDW biomass (r=0.63, P<0.05 for H. uninervis; r=0.65, P<0.05 for S. isoetifolium) and shoot density (r=0.6, P<0.05 for H. uninervis; r=0.687, P<0.02 for S. isoetifolium). 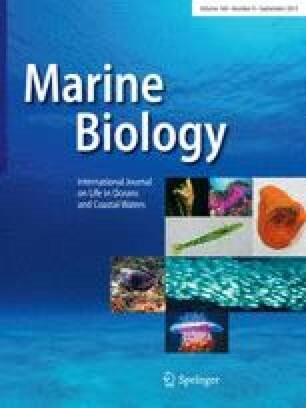 The results generated in this study suggest local seagrass standing biomass is comparable to that reported in monospecific stands from elsewhere. Anthropogenic activities increasingly draw down the resilience of the seagrass beds around Mauritius, and preventative measures are indispensable to achieve coastal ecological stability.